Love it, and how amazing now that it got translated into English. I always admire and lots and lots of respect for Trungpa Rinpoche, and how fortunate for those who have worked tirelessly day and night on this great project. Can you please tell us about the print on this page? What is the translation? Thank you! That is a wonderful recording. Thank you. It is the mantra mentioned in the sutra: om gate gate paragate parasamgate bodhi soha. The sutra explains more about it. 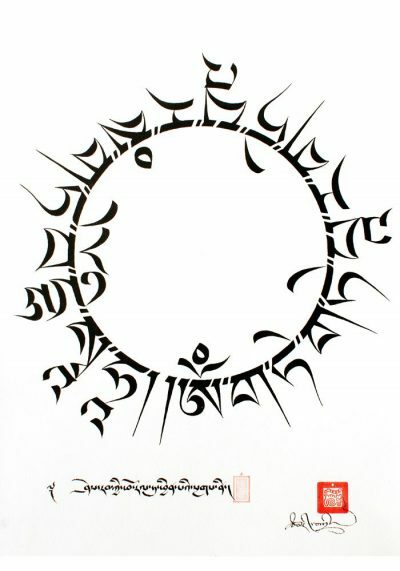 So the circle is the mantra, and the stamp is the signature- what does the line at the bottom say? I don’t know what it says. I’ll let you know if find out. Hi there – may I know how to download this? Thank you. Hi there – thank you very much for the mantra. May I know how to download it? Rejoice…..a lotus for they who have made this beautiful and sacred HeartSutra could be chanted in English. I believe it would benefit many beings especially English spoken brothers and sisters. How wonderful to open this on June 19. Sunday, day before Summer Solstice, FULL MOON. Thank you. Can we not download as a mp3 as this is one of my favorites as is Homage to Tara but there is no pdf to learn by. Thank you thank you. Shukran. Todah raba. Thank you . Shukran. Todah raba. Thank you! Sorry, download is not availiable. very tired of always hearing it in Tibetan and never know what it means. Also, tremendous feelings can be evoked by singing along with the chants because you provide the text when scrolling down. Thanks a million! I play these chants over and over again. Great , wow, awesome, purest, powerful, beyond words, thanks for the wonderful expression of the heart. I would like to have it as MP3 play. Is the recording available on GooglePlay or AppleStore? Where to go, what sould I do? Rodrigo – sincere, heartfelt thanks for your effort in making / sharing this beautiful recording. Thank you Jim for you appreciation! Aloha and thank you very much for your time and talent.While “reciting along with you” , with the help of the NalandaTranslation Committee text I notice a slight omission in your chanting: ” no origin of suffering” is missing. Aloha and thank you very much for your time and talent. While reciting along with you ( with the help of the Nalanda Translation Committee text) i notice an omission in your chanting : “no origin of suffering” is missing. Hey Pauline, thank you for your comment. I am very sorry about this. I will record a correct version as soon as possible. Hi, I’m curious whether you changed this recording in the last few months? is there any way to have access to the previous one? Dear Barine, yes, the recording has been changed. that previous recording was a blend of 2 different translations, and was not entirely correct. I have made recordings of each of the translations now. I hope you like it. Thank you, Rodrigo! So beautiful! Thx for your dedication on this profound Sutra dear Rodrigo. Thx for your dedication on this dear Rodrigo. Makes it so much easier for us to chant it. The first version was good that one is better but not without ‘good’. Please please restore original version! The first version was good that one is better but without ‘good’. Please please restore original version! The first version was good that one is better but without ‘good’. Please please restore original version! Hey Jakub. Sorry I can’t do that. One day I might try record the Heart Sutra again, but for now this is what is.